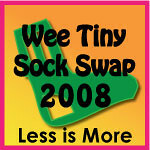 It is time again for the Wee Tiny Sock swap. This is the most fun, the quickest and least expensive swap going. Make you tiny sock, stuff it in an envelope and mail it off. Soon one will be heading your way in return. So if you are slogging along with a big project, take a half hour out and have some fun! Head over to Yarn Miracle for more information. Thanks for the kind words on the socks. I got the call from Afghans for Afghans and they needed socks. I undid the round toe to make them a bit shorter and mailed them off. It must have been meant to be. Since they had been sitting in the bottom of my basket for almost a year. 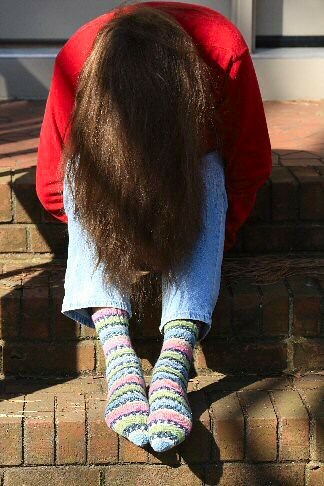 I was not sure if I would have enough yarn to complete the socks. 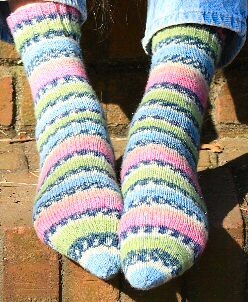 I had used some of it to make two pairs of baby socks for Afghans for Afghans. The first socks was stuck in the bottom of my basket. I really needed something mindless to work on, in between my nursing duties and waiting at the doctors. As I was knitting the first sock the yarn was coming out so tangled that I decided to rewind it into two balls. I weighted the yarn that I had and the part sock. Took a leap of faith and divided the yarn. When I finished the first sock I had 8 inches of yarn left. eek. I weighted the completed first sock and decided I would have enough to try and match the pattern on the second sock. Gulp, I cast on the second sock. I was about two rows off in the pattern. To match better the cuff is two rows shorter then the first sock. After that the patterns between the two socks matched up perfectly. In the picture they look a tad too long. They fit fine, except my photographer was in a hurry and didn't give me a chance to pull them up all the way. First I crocheted, then tatted. I could knit but never really did. For years all I wanted to do was make lace. I love the negative spaces created by lace. At some point I was hit by the knitting bug.And being a bit obessive I am still at it. Mostly socks for my daughter. But I do venture into other areas of knitting. I love the look of fine knitted lace, but have little desire to create it. My lace gene must have gotten over worked at some point.